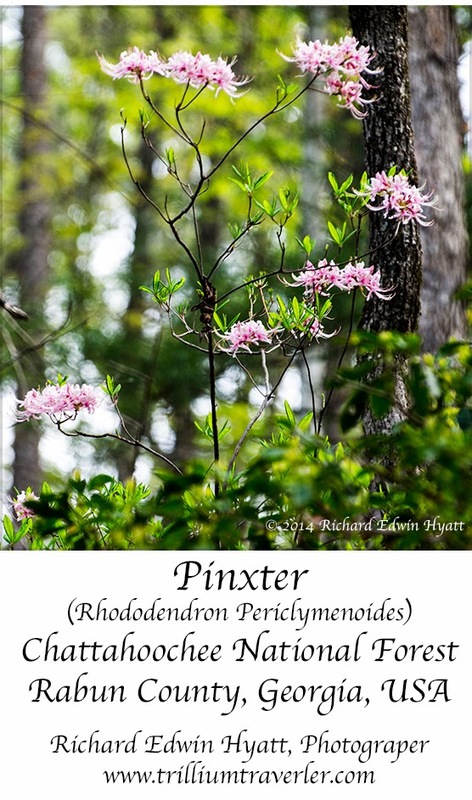 While searching for trilliums in the Chattahoochee National Forest of Rabun County, Georgia, Jean and I came upon this Pinxter blooming happily in the woods. At first we only saw one lonesome flower on a small bush. Wondering where it came from we looked up into the forest and there we found these about 15 feet up above and a bit farther into the woods. When we see these we can expect to see other Rhododendron blooming elsewhere very soon. Another wildflower bush that puts on a show is the Flame Azalea (Rhododendron calendulaceum) and these will soon be showing there beauty, too. Flame Azalea are white to red and bloom from May to June or even July at higher elevations. In the past we have found both these wildflowers and other Rhododendron and Mountain Laurel at Tallulah Gorge State Park. So, keep your eyes open in Rabun County and the rest of the Southern Appalachians this spring!